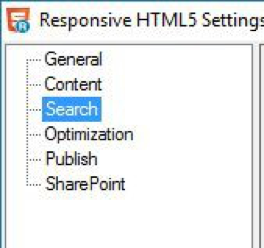 RoboHelp 2015 patch 2 introduces a great feature for Responsive HTML5: sitemaps. A sitemap is a file with a list of all topics in your output. Search engines such as Google and Bing use the sitemap to determine which topics are available in your output, boosting findability of your content. If you want to make 1st place on Google, having a sitemap is essential. Without a sitemap, Google may not be able to index your entire output, skipping useful topics it can't find. Open the Outputs(SSL) pod. (Project > Pods > Outputs(SSL)). Double-click your Responsive HTML5 SSL to open the properties. From the options at the left, select Search. At the right of the dialog box, select Generate XML Sitemap. In the Base URL of the Help System field, add the URL where your content will be hosted. Choose how often your content changes with the Content Change Frequency drop-down menu. Click Save and Generate to create your output. Once you generate, RoboHelp will create the file sitemap.xml in your output. This file is the sitemap used by search engines. Provide this file to your webmaster (or submit the sitemap to search engines to allow them to index your site).